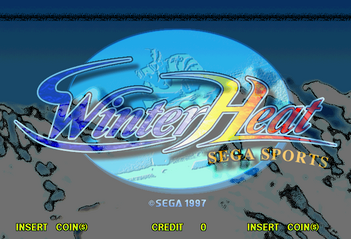 Winter Heat (ウィンターヒート) is a Sega Saturn winter sports game. It was included as part of volume 15 of the Sega Ages 2500 series, along with Decathlete and Virtua Athlete 2K. Special Thanks: Staff of "Benetton SportsSystem Japan Co.,Ltd. ", "Descente, Ltd", "Japan Bobsleigh Land., Ltd.", "Ski Association of Japan. ", "Japan Bobsleigh and Luge Federation." Project Support: Sega Enterprises, Ltd., Products Management Div., CS Promotion Div., Development Planning Dpt., Software Technical Support & Development Div. Main article: Winter Heat/Magazine articles. \STAFF\SATFF.TXT TXT 13,626 Messages from the developers. ABS.TXT TXT (Abstract) 283 About this game.